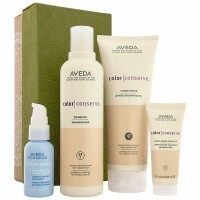 Color Conserve™ Shampoo: Extend the vibrancy of colour-treated hair. Our gentle plant-infused shampoo helps do what harsher cleansers can't—resist fading. Color Conserve™ Conditioner: Our plant-based conditioner seals hair cuticles, helping keep hair color vibrant longer. Color Conserve™ Daily Color Protect: This 93% naturally derived formula leave-in treatment instantly intensifies colour radiance. Light Elements™ Smoothing Fluid: Styling serum weightlessly smooths frizz, helps tame flyaways and adds shine and movement as it restores a healthy look and feel to all hair types.